Writer: You have an accent in English. Are you from Europe? Whether such an exchange ever occurred (the joke has the bitter flavor of truth) is not as interesting as the context. Contempt for Ukrainian literature and the concept of Ukraine as a cultural and political entity independent of both Poland and Russia is still widespread, owing largely to its lack of famous men and women of letters. Although the founder of the modern language was a poet and artist whose balding head, handlebar moustache, and resigned chin (to the fate of his native tongue, some would say) are engraved into numerous monuments worldwide, his existence is practically unacknowledged outside Slavic departments. Even in those hallowed halls enthusiasts tend, after Russian, to study Polish, Czech, Serbian, and Bulgarian before knitting their brows at the oddities of the Ukrainian alphabet, Cyrillic with a sprinkling of one–eyes and two–eyes. Most Ukrainian writers, history regrets to inform us, chose other mediums in which to express themselves. And none was weirder and more brilliant than this small dainty man, the subject of one of the English language's most succulent literary biographies. Symbolism with him [Gogol] took on a physiological aspect, in this case optical. The mutterings of passers–by were again symbolic, this time an auditory effect which was meant to render the hectic loneliness of a poor man in an opulent crowd. Gogol, and Gogol alone, spoke to himself as he walked, but the monologue was echoed and multiplied by the shadows of his mind. Passing as it were through Gogol’s temperament, St. Petersburg acquired a reputation of strangeness which it kept up for almost a century, losing it when it ceased to be the capital of an empire. This is very much the oddness of Petersburg that pervades Russian literature from Pushkin to Bely, the incongruity of traditional European architecture and customs against the thoughts and rapturous originality of its natives. I have not been to Petersburg in a few years, but little has changed. Thirty years passed between Nabokov’s last spring in his hometown and the passage above, which, fifty years later felt like it had been culled from the evening edition of Argumenty i fakty. The point is that Gogol, and Gogol alone, changed Russian literature both for its creators and its admirers, domestic and otherwise. With the possible exception of Pushkin, he is more responsible than any author for how Slavic literary scholars have evaluated the last two hundred years. He did not, however, come about this brilliance by living the simple and successful life of an academically–minded writer who spends days in a library and nights behind his desk. 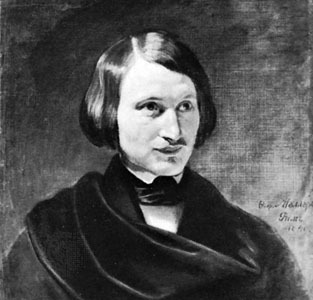 A soft, effeminate man, Gogol was completely impractical in mind and body: he was constantly impecunious, ill, or both; he loved to fib and exaggerate because, like all great writers, fiction was far richer than the worries of a mortal; he listened to no one but himself, fled from creditors and would–be benefactors alike, and traveled alone and aimlessly in Europe for years as if trying to absorb its culture by sponging its streets with his boots. The results were few (Gogol would die, we are told immediately, in his early forties after an abortive leeching cure) but magnificent and his modest corpus is still studied with avidity by Russianists everywhere. Nabokov demolishes some previous attempts at rendering Gogol’s eccentric prose (so badly, in fact, that I don’t think any publisher would have ever hired these poor dead souls ever again) and supplies his own passages, which display his own mastery and wit and swell and ebb with the same unmistakable rhythm of Nabokov’s discursive writings. All of which, I may add, could probably not be written any more clearly or concisely, nor with more passion and understanding for his subject. Yet Gogol’s most significant contribution may well be his obsession with a rather untranslatable word, poshlost’, about which Nabokov digresses for over twenty pages. Poshlost’ has no precise English synonym (the German Kitsch is probably the closest, although this latter is strictly speaking an aesthetic term), but might be explained as the "the belief in or propagation of superficial, sentimental and populist values as true culture." Examples would be pop and paparazzi shows and magazines or any Hollywood love or war story, but with a modicum of discipline these can be ignored. Much more egregious offenders are books which might portray an earnest young man who, in an effort to "make it in the world," befriends some multicultural characters, falls in love with sunsets, dogs and soft jazz, repeats to himself that life is really not about the pursuit of material wealth — although he doesn't quite convince the reader of that — and, at the end of his "journey," metaphorically envisions humanity's fate in the hands of the scattered few around him. Most books, as it were, fall into this disreputable category. The word itself is in very common usage in modern Russian, and has come to signify the unshakeable twitch that surfaces upon hearing or seeing something so absolutely false and so infuriatingly pandering to common thought and common happiness that even pacifists like myself want to smack someone in the vicinity. To Russians' great credit, the word is extremely old and consistently applied; and to Gogol’s credit, he is in every way the opposite of it, just like Tomas is a “monster in the kingdom of kitsch” in this novel. In his Dikanka and Taras Bulba phase .... Gogol was skirting a very dreadful precipice. He almost became the writer of Ukrainian folklore tales and ‘colorful romances.’ We must thank fate (and the author’s thirst for universal fame) for his not having turned to the Ukrainian dialect as a medium of expression, because then he would have been lost. When I want a good nightmare I imagine Gogol penning in Little Russian dialect volume after volume of Dikanka and Mirgorod stuff about ghosts haunting the banks of the Dneipr, burlesque Jews and dashing Cossacks. This alternative reality may sound terrifying to Gogol connoisseurs, but some Ukrainians probably would not have minded. And they would have deeply resented any comments on their status as a minor literature just as much as crude puns, of which Nabokov was particularly fond. Pity that young Ukrainian writer could only remember Nabokov's last two comments. I enjoyed reading this entry on Nikolai Gogol's life and works, particularly as viewed by Nabokov. As you are an authority in this area, I wanted to ask you what your thoughts are on one of Gogol's earlier works, a very short theological treatise written by him entitled "Meditations on the Divine Liturgy." In theological terms, Gogol uses the device of "allegory" to explain the sequence of the Divine Liturgy from beginning to end. Gogol engages in a fascinating explanation of the Divine Liturgy by engaging each sequence and every rubric of the Liturgy with a creative commentary, usually referencing a wholly other spiritual universe in specific Orthodox Christian terms. Inga Vidugirtye describes this technique as "theatricality," which I think presents an excellent framework for understanding ritual in the domain of liturgical theology. I am curious as to how often the express Orthodox Christian religiosity of Gogol is encountered in his later works, and if so, how pronounced it may be. The purpose of the present article is to demonstrate the theatricality of Gogol’s Meditations on the Divine Liturgy. Theatricality is “the language of theatre as art”, as Jurij Lotman has stated. Phillis Hartnoll points out three aspects, viz. an actor, a dialogue, and a spectator, that separate theatre from its origins – the ritual. The birth of the spectator seems to Lotman and to Boris Uspenskij to be the decisive factor to establish a situation of the performance. The visuality of the performance is the main feature of theatre as art. There are three presumptions Gogol has about liturgy: (1) liturgy is a dramatic form of the evangelical plot, (2) the forms of worship in liturgy are so perfect that watching them is enough to understand the meaning of the ritual, (3) in liturgy, it is possible to achieve the unity of souls and feelings of all participants of the ritual. Gogol presents liturgy as performance. The narrative is based on separate scenes with clearly marked beginnings and ends. Gogol even renders intonations of dialogues between a priest and a deacon. The motif of performing distinguishes Gogol’s work from his predecessors. The only point of view in the text is from the outside. The narrator is one of the spectators of liturgical performance. On the other hand, the narrator is also a participator of the worship. Gogol shows the effect the performance makes on people and also renders their praying. Taking the sacrament is described as catharsis and in the same terms as Aristotle has done, viz. the horror and the purging. So even at this moment the theatrical nature of liturgy is retained. In the context of the Gogol’s discourse of theatre, liturgy seems to be the ideal performance. One can presuppose that the writer’s wish to explain the role of the theatre has ended with describing the most spectacular performance of the orthodox ritual. In doing this the writer was most likely influenced by the Ukrainian baroque tradition which shaped Gogol’s artistic imagination. The theatricality of the baroque aesthetics found its place in the visual nature of Gogol’s texts. In his search for new creative forms Gogol was not alone. In 1842–1843 Adam Mickiewicz pointed to the Greek tragedy and to the mysteries of the Middle Ages as possible examples to follow in the future Slavonic theatre. By demonstrating the theatrical possibilities of the Christian ritual Gogol was close to these ideas." Thank you so much for your thoughtful comment. I don't believe I've read this text but it seems extremely interesting. I will consult my Gogol volumes and get back to you. That said, I am familiar with Lotman and his approach to theater. That a mute view of liturgical (and widely speaking, ritual) action promotes sufficient understanding I find to be quite telling. A nice topic for investigation, my dear Paul. In reviewing your archives listed on the sidebar, which I think you have organized in a most splendid manner, I returned to thinking about Gogol. I have one question for you. I am curious as to your thoughts on this. Yes, I saw that movie, and the name had little to do with plot development. I have not read the book, but cannot assume that the text was peppered by references to Gogol's life (cold climate; complete disassociation from reality and women; an incredible penchant for wasting money and time while contemplating some whimsical details of bourgeois existence; an endless European wanderlust looking for something, something rather elusive that turned out to be Nikolai Gogol). Most likely, the author found the name sonorous, understood its tragic value, and placed it in a modern context. Sometimes, it appears, allusions are simply names with no particular significance. This is very interesting. In the novel, the decision of the Ganguli family to name their child Gogol instead of "Nikhil" had almost everything to do with the development of the plot and indeed permeated the entire novel. Indeed, chapters were devoted to the meaning of the name and its significance for the young Gogol. [Gogol] told his parents what he'd learned in Mr. Lawson's class, about Gogol's lifelong unhappiness, his mental instability, about how he'd starved himself to death. 'Did you know all this stuff about him?" he asked...'I don't get it. How could you guys name me after someone so strange? No one takes me seriously,' Gogol said." Lahiri, Jhumpa. The Namesake. Boston: Houghton Mifflin Company, 2003. 99-100. While I say this is interesting, it is of course not the least surprising in terms of the Hollywood effect which can distort, twist, and obscure the beauty of the novel experience. But call it artistic license, I suppose. If I were a novelist, I would allow Hollywood to do whatever it wanted to with my works, as long as the novels were still available to the public at large and I profited handsomely from the arrangement. Thanks for sharing excerpts from the novel in question. I imagine that the book-bound Gogol Ganguli has a lot more to ponder than the thin and unappealing screen adaptation. The word "gogol'" is Russian is very unusual for a surname, as it means "goldeneye duck"; Gogol himself being such an odd character may have had something to do with his bizarre name. A filthy pile of details, my dear Paul.